Looking at the pile of CDs awaiting me to review my wife cracked “Isn’t it about time that you were feeling Gouvy?”. This rather pathetic effort at a pun reminded me that this composer, a new name to me, was next on my list. So we sat down and, for some reason, listened to the disc’s third piece, the unpublished Fantaisie Symphonique. We were immediately impressed and delighted. Who was he? Without going into too much boring detail the CD is financially supported by the Conseil Régional de Lorraine, as the composer was Franco-Prussian. There is even an ‘Institut Théodore Gouvy’ based at the large house in the Moselle region, belonging to his wealthy businessman brother and in which the composer lived from the late 1860s. Although many of Gouvy’s works were premiered in Paris he was more associated with Leipzig. His music although often elegant in a French way is not otherwise Gallic; nor is it German. While you feel utterly at home and familiar with the language you may well fail to be able to pin it down, although Louis Spohr occasionally came to my mind. As for the Fantaisie symphonique, the first movement is a big-boned structure in sonata-form with a complex development section. The ensuing Adagio and the finale, marked Alla breve, do not quite justify the work’s length. Gouvy tried to circumvent that by creating a somewhat serious but short-breathed fugue in the finale. Structurally then, it’s a curiosity but its title provides some mitigation and the melodies are often engaging. Anyway we felt well set up for another work. 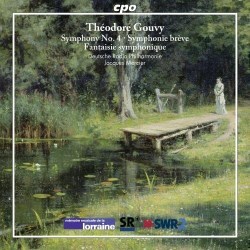 There are six symphonies by Gouvy, all available on CPO - see review of symphonies 3 & 5 - and much chamber music. The Fantaisie was written once he had completed the cycle. The Gouvy website seems to imply that Symphonie brèveis number 6. In fact CPO have already recorded that work. In any event, Symphonie brève is in another unusual format: that of a theme with five variations and a Rondo finale. A strange thing happened, as I was about to study this work. My wife had to go to Metz, the capital of Lorraine for a brief work-related visit and I went with her. We were driven from the airport and met several of the friendly locals. One thing that came across over the three days we were there was that, as they happily admit, these bilinguals are slaves to no-one and quite individualistic. Sadly however, even the more astutely artistic people we met had never heard of Gouvy. Anyway Symphonie brève is just that - original and stylish and strong, all at once. The theme is decidedly melancholic but the screw tightens through the variations. The long, melodic line however is never really lost and the Rondo bursts on the scene rather as if one has happened by chance upon some bucolic dancers. There is again, a short fugue, and the counterpoint in this movement is deft and logical meaning that the dancers, sadly, never get over-excited and maintain great decorum throughout. Even so, this is a most likeable work. Gouvy had a great deal of difficulty in finding an orchestra either in Paris or in Germany that would play his music. Nevertheless he continued to write demanding works. The Symphony No. 4 is in four movements with a Scherzo coming second. This first movement is very impressive, almost Beethovenian in its drive and passion and superbly constructed. Gouvy’s fame and popularity, especially in Leipzig but also in Paris, is easily discernable and his subsequent obscurity difficult to comprehend. The fleeting Scherzo is beautifully orchestrated and has some fascinating effects. Although lightly coloured there are passages with low strings and trombones, a sound also employed in the charming and soothing slow movement called Intermezzo. This movement and the last were re-written by Gouvy before its publication. The Finale is lively and sometimes contrapuntal. It reaches an exciting climax with braying brass. Although you might expect me to say that Brahms or Mendelssohn could be discerned in Gouvy’s works, I heard, especially in the athleticism of the upper string writing, Carl Maria von Weber. This disc has encouraged me to explore some other works by Gouvy and it might do the same for you. The performances under Jacques Mercier are strongly characterised and persuasive. Mercier knows this style well having recorded the other three volumes. Therefore there is no reason why you shouldn’t instantly buy it.